"Telling the story helps us focus." When we went to Nijmegen in January 2018 to discuss these new flood management approaches with colleagues from Wageningen University – city planners, landscapes architects, entrepreneurs, creative artists, historians and citizens – I instantly felt the amphibious nature of the place. This is, of course, not only the case in Nijmegen. Half of the Netherlands lies below sea level. For centuries, the Dutch have wrested their land from the water. This is a vital part of the Dutch identity. It is anchored, so to speak, in the collective genotype. And, so far, it has been effective. But the flooding of the Rhine in 1993 and 1995 was a warning shot for the Netherlands, because it became apparent that the North Sea was not the main cause of the problem. The river Rhine and its tributaries convey most of its waters to the Netherlands. The Waal, which flows though Nijmegen, is the main distributary branch of the Rhine, carrying over two thirds of the total flow. During dinner at a restaurant at a former Waal dock, first stories about the "Room for the River" program in Nijmegen were shared at the table. I learned that the previous vice mayor of Nijmegen, "a strong no-argue-person from the most influential political party" has been a driving force for the far-reaching activities in Nijmegen. Moreover, Nijmegen seems to hold the nickname "Havana of the Waal", which indicates a rather liberal political attitude in town. "People took a lot of time to understand what the river wants, how it works," a member of the dinner gathering remarks. When we arrive at our lodgings – the 1885 constructed vessel "Opoe Sientje", which now exists as an atmospheric museum and boat hotel in the Waal harbour of Nijmegen – we meet its owner, Leon Berkers. Leon is a key player behind numerous festivals and other events along the Waal. He leaves no room for doubt that we need to live in tune with the water instead of mastering it; however "this does not mean we cannot enjoy it", he says. 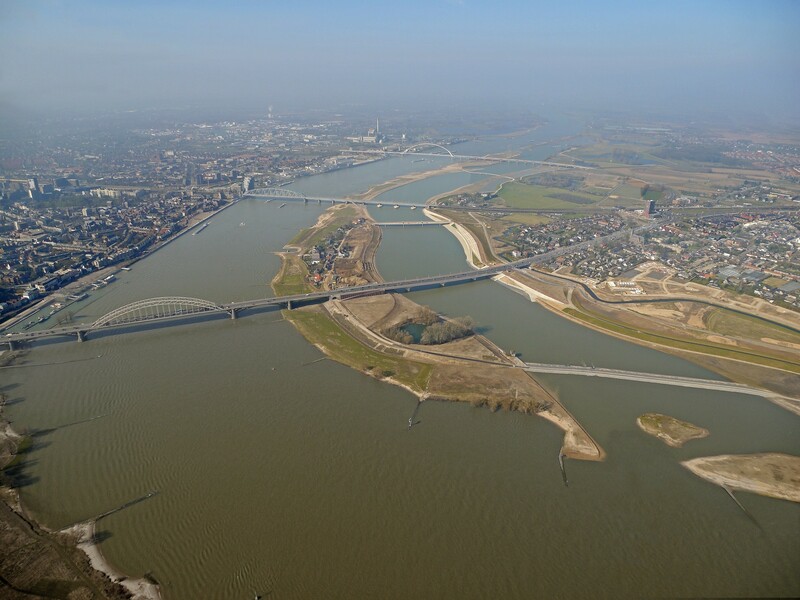 The next morning, we continued our investigations, meeting with the engineers and landscape planners responsible for Nijmegen's Waal solution. Our aim was to understand the process that resulted in the wisdom of allowing the water to enter Nijmegen, while protecting it from its destructive forces. The experts told us that climate-related data and other information was a vital component in making the decision to move the former Waal dyke and construct an ancillary channel in the flood plains. Nevertheless, they also emphasized that, "the story behind the data is more important than the data itself." Understanding the perspectives and needs that enable innovative solutions requires situational and problem analysis that take cognizance of the interests of different stakeholder groups. Initiated by the national government, the execution of Nijmegen's "Room for the River" program was a community-led process in which local desires for water safety met national mandates for coupling flood protection with spatial quality. Last but not least, data and other information unfolded their powerful forces only on the grounds of historically grown convictions and entrepreneurial visions. The many tourism and recreational businesses emerging from the "Room for the River" program – which we visited after the meeting on a bike tour along the Waal – document this perfectly. Since the Dutch have demonstrated the ability to stay ahead of their river flood problems, we wondered how national and local levels prepare for those climatic changes that tend not to be a typical Dutch domain, culturally speaking. These include potential heat stresses and droughts and an increase in water and air temperatures. Could climate data and other information inform new cycles of adaptive policy programs in the Netherlands and elsewhere? In the Innovation in Climate Services Provision (INNOVA) project, we have just started to investigate how and which climate related services could be beneficial products in the specific societal contexts of the INNOVA hubs in the Netherlands, Germany, Spain and France.